Paddy (Robert DeNiro), Sam (Kevin Kline), Archie (Morgan Freeman), and Billy (Michael Douglas) have been friends since they were kids. They referred to themselves as the Flatbush Four. It is now 58 years later. They have gotten older. And all but Billy have gotten old. They spend their days lamenting their old age. Billy, on the other hand, is living the good life. He’s rich, successful, and about to marry a beautiful woman who is in her early 30s. Despite the issues they’ve had along the way, and their advancing age, the Flatbush Four reunite in Las Vegas for Billy’s bachelor party. They arrive in Vegas to find out the hotel they were going to stay in is under renovation and won’t be open as a hotel until next year. While trying to figure out what they are going to do, they meet Diana (Mary Steenburgen), a lounge singer, who is no spring chicken herself. The men are enchanted by her, and she finds time to hang out with them while they’re in town for the weekend. After cleaning out his pension to spend some time at the Black Jack tables, Archie gets the group the penthouse suite at the hotel Billy is staying in. During their adventures, the gang finds themselves in many similar situations to those they had as boys. During one of these adventures, a young man is convinced to become their personal concierge for the weekend. The weekend culminates in a huge, blow-out party to celebrate Billy’s nuptials. My fear going into Last Vegas was that it was going to try to be a geriatric The Hangover. I was pleasantly surprised that they didn’t choose this route. Instead, it is a more believable romp by a group of elderly men. Robert DeNiro, Morgan Freeman, Kevin Kline, and Michael Douglas mesh well together. A wise choice in casting. The comedic timing of the group is very good. I like DeNiro when he is given good writing. As I’ve said before, I hate when he becomes a caricature of himself. Mary Steenburgen plays well off the group. It’s nice to see that they opted for someone age-appropriate for the rest of the gang, who fits in believably. I have to say, though, that drunk Morgan Freeman was definitely the highlight of the film. Last Vegas has plenty of laughs, even if most of them are old age jokes. It’s what they were going for. That being said, I think I’m a bit younger than the target demographic for the film. If you’re looking for a movie night with your mom (or dad), I think this would be a good choice. It’s a film I think that generation would love. I’m pretty sure my mom would. And it’s funny enough to keep you entertained.It gets a little cheesy towards the end, but I guess it was really the only way to wrap things up. It’s not offensively cheesy, I think it’s just geared more towards a slightly older audience. 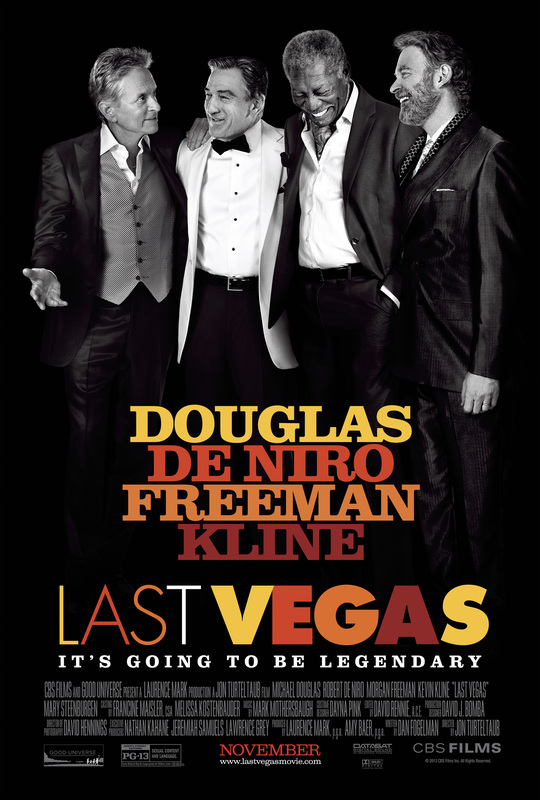 I saw Last Vegas and really enjoyed it!